This is either Oliver or Ollie. One of the two river otters that lived in our backyard for about a year. Kent made an elaborate cage with a pool and faux rocks made with chicken wire and cement if I recall correctly. Oliver and Ollie were domesticated (mostly) and were lent to Kent for a year. Apparently the animal trainer's wife was thrilled to get rid of them. One of them had this thing for biting women on the heels. Something my mother and her best friend experienced quite a bit. The stories of the river otters are some of the funniest in Kent's third book "A Fine and Peaceful Kingdom". It is out of print now, but you can find copies easily on Amazon and Ebay. 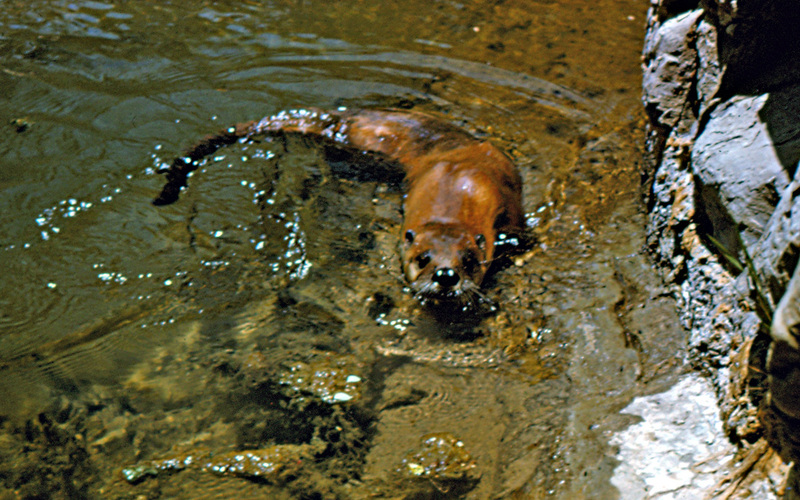 Some footage of the river otters was used in the 1969 film, "Ring of Bright Water".